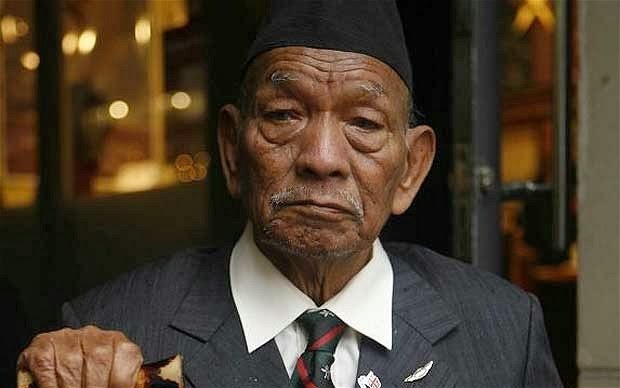 Lieutenant Tul Bahadur Pun, who died on April 20 aged 88, won the Victoria Cross while serving with the Second Chindit Expedition in Burma in 1944. 6:58PM BST 21 Apr 2011 Early in March that year the Second Chindit Expedition, a force of six brigades comprising some 9,000 men together with stores, was air-landed in Burma. The main objectives of the Expedition were twofold: first, to support the advance on Myitkyina by the American-led Chinese troops and to establish a strong position astride the Japanese lines of communication; and secondly, to impede the build-up of Japanese forces for an invasion of India by harassing them in the Mogaung area. On May 27 the 77th Indian Brigade was ordered to capture the Japanese supply centre of Mogaung. After almost a month of savage fighting which had greatly depleted the brigade’s numbers, the 3rd Battalion 6th Gurkha Rifles was ordered to attack the railway bridge at Mogaung on June 23. As soon as the attack had been launched, the Japanese opened concentrated and sustained crossfire at close range from a position known as “The Red House” and from a strong bunker position 200 yards to the left of it. The citation for Pun’s Victoria Cross declared: “Rifleman Pun’s courage and superb gallantry in the face of odds which meant almost certain death were most inspiring to all ranks and were beyond praise.” Pun was invested with the Victoria Cross by the Viceroy, Field Marshal Viscount Wavell, at a special parade held at the Red Fort in Delhi on March 3 1945. Tul Bahadur Pun was born on March 23 1923 at Banduk village in the Myagdit district of west Nepal. He enlisted in the Gurkha Brigade in west Nepal and, after completing his basic training, joined the 3rd Battalion 6th Gurkha Rifles for the Chindit Expedition. After Independence in 1947, he transferred to the British Army and joined the 2nd/6th Gurkha Rifles, seeing action in Malaya and Hong Kong. He rose to be regimental sergeant major of his battalion and retired from the Army in May 1959 in the rank of honorary lieutenant. Pun came to England in 2007 and settled initially at Hounslow, west London, before, last year, moving the short distance to Chiswick. He attended many reunions of the VC and GC Association, supported many Gurkha charities and in 2009 was made a Freeman of the borough of Hounslow. Pun, who presented his VC to his old regiment, died at Banduk, where he had gone to be present at the opening next month of a new secondary school. He was twice married, and is survived by his second wife, Punisara, and by his two sons and eight daughters.